Mailed to: Master Bobby Gerlach 259 S. 21st St. Irvington N.J.
Yours truly Bobby W & Rudy C.
Please see the note below the post card. 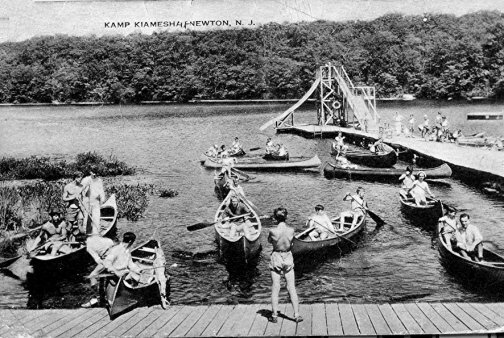 "I saw your post card of Kamp Kiamesha in Newton, NJ and was wondering if you may be of help. As a former member of Kamp Kiamesha I am seeking other former members from the late 1940s to early 1950s. I have many photos and other memorabilia from my days at Kiamesha and would welcome any contacts to share old times. I'm 68 now and should have done this a long time ago. Richard Kimmel - Kamp Kiamesha 1948-1952"